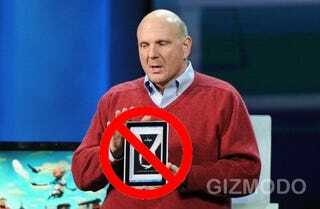 HP is killing its Windows 7 "slate" tablet project, says TechCrunch, citing a source "briefed on the matter." UPDATE: HP replied to me with a standard "We don't comment on rumors or speculation." This seems to me to be further confirmation however, because if the product was still on target for this summer, surely HP's sales and marketing people would beg that PR affirm the thing's continued healthy existence. Letting it die in the public eye wouldn't be good if it actually was still kicking.